World 5-4 is the fourth level of World 5 in New Super Mario Bros. 2. The area features many rising and sinking mushroom platforms, and is inhabited by several Koopa Paratroopas and Koopa Troopas. At the beginning, there is a blue mushroom that if stood on, lower in height, but return to neutral height when jumped off. After the second set of ground, there is a pink mushroom that if stood on, increases in height, but return neutral when jumped off, much like the blue mushrooms. There are some ? Blocks above this mushroom, one holds a coin, and the other holds a Super Leaf. The third set of ground has a red Koopa Troopa and after that, more blue mushrooms, but now with some Paratroopas. Three more ground platforms exist beyond that, There is a Gold Ring above the middle one, and a red Koopa Troopa on the right one. Next there are five more mushrooms with some red Koopa Troopas on them, the first and last are pink, the other three are blue. At the end, there is a below-ground level brick containing a 1-Up Mushroom. The next ground has bricks, but the middle is actually Gold Bricks. Below, the player will find a Star Coin. The Ground after that has a red Koopa Troopa. There's five more mushrooms, alternating blue and pink, starting with blue. There is a Roulette Block above the middle mushroom. After that is an unenterable pipe and a Checkpoint Flag. The next ground has nothing, but the third has a red Koopa Troopa and a ? Block. Next is three mushrooms, the middle is pink, the rest are blue. There is a Red Ring above the pink mushroom. The next ground has a brick block which is actually Gold Bricks. Next there are two blue mushrooms with a Star Coin in between and a Paratroopa underneath. Next is ground descending in a stair format, with a jumping Paratroopa. Next is three blue mushrooms, with some Paratroopas, and finally the Goal Pole. 1. After encountering the Gold Ring, follow the mushroom's path. There is a Koopa on the right of the coin. Use the shell and throw it in the bottomless pit to get the star coin. 2. By Wall Jumping. This is dangerous since there is a gap on the right so slide on the left. Star Coin 2: The player must stand on the pink mushroom platform immediately after the Roulette Block, which leads to a secret area in the sky with the Star Coin. If Mario jumps out of the pink mushroom platform, it is inaccessible. Raccoon Mario can also fly to the star coin. Star Coin 3: The third Star Coin is found floating over an abyss between two blue mushroom platforms. 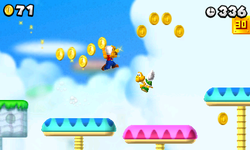 The player can either bounce off the Paratroopa, or use a Koopa Troopa's shell to collect it. This page was last edited on April 9, 2019, at 18:03.